I just got off the phone with my grandpa. He is a very humble and kind man, the type of man everyone just loves to sit and chat with for hours. He has a great sense of humor and loves to tell me stories. Today one of his stories had to do with his memories of the Great Depression. My grandparents were just kids when it happened but my grandpa remembers it vividly . He told me about how sad it was to see so many people lined up for soup. He said the lines were really really long. He said that people would often come knocking on his parents door begging for food. His mother always fed those that came. His family, he said, was prepared in many ways for the Great Depression. Further, they worked really hard during it. As a result, they were able to keep their home, stay fed, and made it through the very difficult years without losing everything, as an unfortunate many did. Then my grandpa reminded me of when in 2008 the stock market nearly crashed and the housing market tanked. Thousands, even millions of US citizens were out of work and lost their homes. We have a summer home in a small town and the community got hit really hard. It was a thriving little town and now it has become a little more than a ghost town. It’s really sad for me to drive down the main street and see a lot of the vacant, run down buildings where businesses used to thrive. Many cities and towns were hit hard in America and unfortunately things haven’t changed like they did after the Great Depression. My grandpa told me to prepare and do everything I can to make sure my family can withstand a crisis like he has seen come to too many women, children, and men. Here are some tips he gave me. I’ve also added a few extra details that I know are important from further research. 1- Get out of debt. Do your very best to get out of debt as soon as possible. 2- Start or keep building up savings. The book I co-wrote talk in depth about how to build a savings. You should be saving 10% of your income. If you can’t afford 10% start off with as much as possible. Don’t touch the savings either until you have enough to account for 3 full months of living expenditures. After that you can use the rest for investments. 3-Build a food and water storage. You should have extra food and store water in your home/storage areas. Aim to accumulate at least enough to last your family for 3 months. Most resources I have read suggest having basic food staples (wheat, rice, oats, beans, powdered milk, etc.) to last one year. If you learn to coupon, you can begin stocking up on food and start building your storage without too much extra expense. Here is a beginners guide to couponing. 4- Protect yourself financially. My grandpa and my dad have been telling my siblings and I that the safest places to put your money are in precious metals, real estate (if you can afford it), and other safe investments. After your consumer debt is paid off (if you have any), but before your home is paid off, start acquiring precious metals. My grandpa illustrated that since Jesus was betrayed by 30 ounces of silver we know that they used silver back in the B.C. days. Even today silver and gold are legal tenders. Further, they can be easily sold and used for trading. He said that when you need cash you can sell silver and gold in a matter of minutes. If/when cash is no longer strong, silver and gold will be great ways to buy things or trade with. Commodities and necessities also trade very well. He told me to diversify. The common saying is correct, “Don’t put all your eggs in one basket”. Silver and gold can bail a person out when they need cash quickly. During a long-term depression often food and other necessities are more easily traded. If you haven’t already gotten started accumulating precious metals a great place to buy is on Amazon.com. Here are some silver coins you could buy there as well. Even buying one silver coin every week or two (they range from $20-$40 each) will get you started on building up a good supply. My dad used to tell me that affordable housing will always be a necessity. So if you can purchase real estate to rent out or turn an unused portion of your home, garage, or property into a rental unit, that is a great way to get more financially secure as well. 5- Learn how to garden. The quality of American food is declining while prices are simultaneously rising. Learning how to garden and grow your own veggies and fruit are great skills to have at anytime, but especially during hard times. In addition, raising chickens for eggs and meat are also important skills. I love to watch documentaries on Netflix. Many of them are about how people live off of the land in Alaska and other wilderness areas. I’ve noticed that most everyone seems to raise chickens and turkeys. And figured out that it’s mainly because they give or are a great source of lean protein. Further, home-raised chickens don’t have the hormones that are in most store bought eggs and meat. 6-Get armed and protected. It’s important either for protection or for food/gathering to have a gun. I recommend owning at least one. Shot guns are great (especially for hunting birds and protection) but a handgun works as well. Another form of protection is a very unique pocket-sized device called TigerLights. 7-Learn how to be frugal. There are so many ways to save money. Often we spend more just for convenience. Subscribe to my blog to learn more frugal and money saving tips. Don’t get overwhelmed if you feel like there is too much to learn. I co-wrote this book with a financial wiz. There are many step-by-step ways to becoming frugal if you aren’t sure how (or if you want to get better at it). There is a saying that I love, “By small and simple things are great things come to pass”. Saving a little here and there really does add up. The book I co-wrote talks in depth about this principal. 8- Learn how to fix and repair things (AND teach your children). Growing up, I honestly thought we were poor. My dad and mom had very long lists of chores we had to get done each day. Saturdays were PROJECT days. We learned how to tile, hang sheet rock, perfatape, re-shingle a roof, fix plumbing problems, fix sprinklers, do laundry correctly, and many other skills. I thought we had to do all of these things ourselves because we were poor. I have since learned that my parents were teaching us vital life lessons and skills. These would enable us to fix things, be more self-sufficient, save money, and most of all, empower us with a life long and vital work ethic. Prepare your family by teaching them skills and making them learn how to work hard. 9- Have a 72 hour kit. Some times when people lose shelter and have no food it isn’t brought on by a depression but by a natural disaster. Usually in these situations relief does come, but it is not immediate. Having a good 72 hour kit that is kept near the door or in the car is a great way to prepare for desperate times. Click here for a post that has been very popular about 72 hour and car emergency kits. 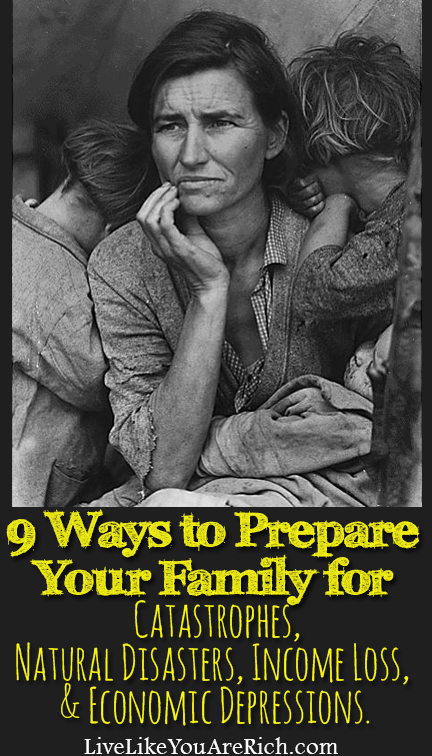 Doing these 9 steps will not only help your family survive through a potential Great Depression, but also through job loss, other catastrophes, and even natural disasters. For more ‘living rich’ tips please subscribe, follow me on Pinterest, and like me on Facebook. These are some very important pieces of advice as to how to survive a depression. I believe in storing food, planting a garden, coupons as well as learning to fix things in and around our homes. While it is crucial to plan, I believe its also very important to teach our children to be content with what they already have. Nice info. My family is on the right track. The word I’s does not exist. Use the word My. I love this list. It direct and straightforward. I agree with all. My grandparents went through the Great Depression my mom was born during it. They are and were very frugal and basically followed your list as a life style. Simew along the way my generation lost sight by having to have it now whether there was money for it or not. Now we are payjng forf it by trying to revert back to the frugal way and finding out we have a very long row to hoe before we get there. This is great advise if only more would listen, I’m very impressed with one so young. The nation has had prosperity for so long that the population has forgotten basic principles of frugality. I absolutely agree. My parents raised 9 children in the Depression, I was the #10 after the World War 2 so all my brothers and sisters were raised in the Depression. This has made a big impact on me and it has helped me raise my own eight children. Thanks for your impute!!! Tress- Thank you so much for this kind comment. I appreciate it. Yes, our grandparents or great grandparents learned so much about tough times and getting by with just a little. Prosperity is such a blessing but it can also make us forget to save, learn to be innovative and frugal, and appreciate the value of hard work. Thanks again! I love the simplicity of this list! I have always enjoyed having a garden but THIS year I want to try to learn how to make the best use of the space available. Also, I want to learn how to can & otherwise preserve what I am able to reap from the garden but don’t immediately consume so I can 1. have a food pantry filled with good, home-grown food & 2. get the full worth out of my garden! This way it isn’t just a ‘hobby’! Mary- What a great idea! Canning veggies and fruit, even meat is a great way to preserve what you have grown, save money, and build a food storage. I’m planning on doing that too :). The photograph was taken by Dorthea Lange. Best was to recession prof your self is to get a college degree in health care. Tamara- Thanks great to know who took the photograph, its incredible. Yes it does seem moving forward that healthcare may be the ‘safest’ place to be in the future. Thanks for your comments. I love this site. You have so many interesting stories and a lot of great information on so many subjects. So glad to have found your site. Thanks! Terri- Thank you, I really appreciate your comment/compliment 🙂 I appreciate you reading! This is a very neat post. My husband and I are just starting to do some of these points but you mentioned some we didn’t think of like the precious metals. Thank you so much for sharing this info. It certainly gave us some new ideas on how to prepare and protect our family. You lost my respect with the guns. You probably won’t post this comment anyways. Jennie- I publish comments that have differing opinions. I always like to say, “Different strokes for different folks”. And I’ll just put in a plug that there is a lot of misinformation out there about guns and gun safety. The media loves to talk about bad. Bad this, terror that, tragedy here, killing there. I just ask that whoever reads this and doesn’t know whether having a gun is a fit for you, to do some substantial research on the topic and not just base decisions off of the media (their goal is to inspire fear) its what gets the reviews. Learn about guns elsewhere. My Husband is a Det. Lt. For PPD…we always talk about the same things mentioned in your article….he always said… you should learn to handle a weapon and learn to protect yourself ….I totally agree with YOU AND MY Husband!! Karen- Thank you for the great feedback. I appreciate your and your husband’s opinion. It is important to be able to protect ourselves. Thanks again! Great post. Lots of food for thought. The Amazon.com link in the precious metals section is broken. I grew up in a very frugal family. We grew our food in the garden. And used what we have until we cant really use it anymore like clothes we wore it out until there is a hole in it. Very helpful tips. I need to stock up my pantry food ! Marlin- Thanks for the comment. What a great way to be raised! Yes my parents did similar things. I totally thought we were poor (It wasn’t until I was older that I realized my dad was a millionaire) but he made us work and work hard! Your parents must have understood the importance of working hard and being prepared. Thanks! I agree with everything on this list. Make sure you have enough food items to take care of your family and things to barter with if you are preparing for economic chaos. If you are wanting something to invest in…invest in land. My grandpa always said, “buy land..that is the one thing The Lord is not making more of.” If you want good ideas, no matter what you might think of their religion, the Mormons have been telling their people for more than 100 years to have a years supply of food, water, etc. Check our their webpages for ideas. Dee dee- Yes the Mormon (Church of Jesus Christ of Latter-Day Saints) are the champions of having a good supply of food, water, and being prepared. Their/our resources are wonderful. Agreed! Great ideas. Thanks for the comment! Great article! I seriously love your blog, you really seem to know your stuff. You wrote “My grandpa and my dad have been telling my siblings and I that the safest places to put your money are in precious metals….”. Do you have any precious metal companies you would recommend? I always see and hear commercials for buying gold coins and such and I don’t know which company is the best. Do you (or your dad or grandpa) recommend coins or bars? Ok I just realized as I read further down that you already kind of answered me lol. Sorry.